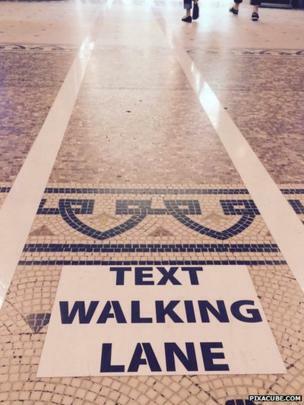 After China, Belgium to have "text walking lines"
Temporary “text walking lanes” have been allotted to people using their phones in the center of the Belgian city of Antwerp, as a step to avoid accidents due to collision. The initiative which is being looked upon as a publicity stunt is the brainchild of a smartphone store based in the city. It says that a significant number of mobile phone breakages happen because of “text walking” collisions. “You probably walk through the streets while texting or sending WhatsApp messages to your friends and don’t really pay attention to your surroundings – only to whatever is happening on your screen,” a spokesman for Mlab, a smartphone laboratory based in Antwerp, was quoted by Yahoo News as saying. As of now, the concept of these lanes has been applied on a temporary basis. Officials, however, say that they’re most likely to be made permanent. Belgium isn’t the first place to have adopted this idea. Before this, the city authorities of Chongqing, China, had designated a 30 meter (100 foot) “cellphone lane” in 2014 to tackle the problem of distracted walking.